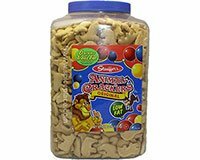 Supersize container of Original Animal Crackers. Low in Fat, 0 grams of Trans Fats per serving. Ingredients: Enriched Flour (Wheat Flour, Niacin, Reduced Iron, Thiamine Mononitrate [vitamin B1], Riboflavin [vitamin B2], Folic Acid), Sugar, Partially Hydrogenated Soybean Oil, High Fructose Corn Syrup, Salt, Sodium Bicarbonate (Leavening), Soy Lecithin (An Emulsifier), Natural Flavor, Spices (Nutmeg and Mace), Nonfat Milk. Allergy Information: Contains Milk, Wheat and Soy.